HT’s international and world-traveling students give us a glimpse of what high school is like in other countries. By Yoojin Jang ’20 and The Gold and Blue student newspaper staff. Carmen Navarro-Poyo found it hard when she first got to Holy Trinity because she spoke so little English, but now that her English is so much improved, she was able to tell us about her school in Spain. In Spain, Carmen said, classes last one hour. Each student has 14 subjects, but the classes don’t meet every day. In addition to the classes American students take, Spanish students take Music, Latin, Economics, Computing, Castellano and Valenciano (those last two are different kinds of regional Spanish). Also, they take all three major branches of science—physics, chemistry, and biology—every year. School starts at 8:00 a.m. They have two one-hour classes, a 20-minute break, three more classes, then a long break when students can either eat lunch at school or go home for lunch. Classes resume at 3:00 p.m. and go until 5:00 p.m. At that time the school closes, so everyone must go home. Senior Hafeez Soberu comes from Nigeria, the largest country in Africa. There, students don’t enter high school until 10th grade and when they do, they must declare a major: engineering, architecture, business, science, or law. There are important standardized tests that decide what kind of school a student can go to. The kind of school could determine whether a student can go to college. Hafeez says that in Nigeria all students must take Religion classes, even in public schools, but they have a choice between Christian and Islamic studies. Also, retreats are all in school, and they are mostly about preparing for finals. School in Nigeria starts at 7:40 a.m. and goes until 3:30 p.m., with many students going to over an hour of tutoring every day, bringing the school day up to nine hours. But in the middle of the school day, there is a 20-minute resting period during which you can take a nap. Another major difference is that if you do something wrong, “the teachers can hit you with a stick!” There are intramural sports, but no inter-school varsity sports. Private schools are better academically and safer than public schools because there are no “cultists” or gangs. Some American-born Holy Trinity students have experienced foreign schools as well. Even though he was born in the U.S. and went to Oak Park River Forest High School for his freshman year, Anthony Wilson-Sowah ‘18 and his brother Christopher ‘20 went to African schools for two years, one year in Ghana (where his dad is from) and one year in Togo (his mom’s native country). Anthony said his parents wanted him and his brother to have the African experience because they thought it would make them more serious students. They spent their first year at a boarding school in Ghana. “We went to school from 7:00 a.m. to 2:45 p.m., but we had to get up at 4:30 a.m. to shower, clean up and do other things,” Anthony said. Classes were one hour, and they did not have breakfast until 9 a.m. They had free time from 2:45 to 6:00 p.m., then dinner followed by a mandatory study hall from 6:30 to 8:30 p.m. They were supposed to be in bed with the lights out by 10:00 p.m. so they could get up at 4:30 the next morning. 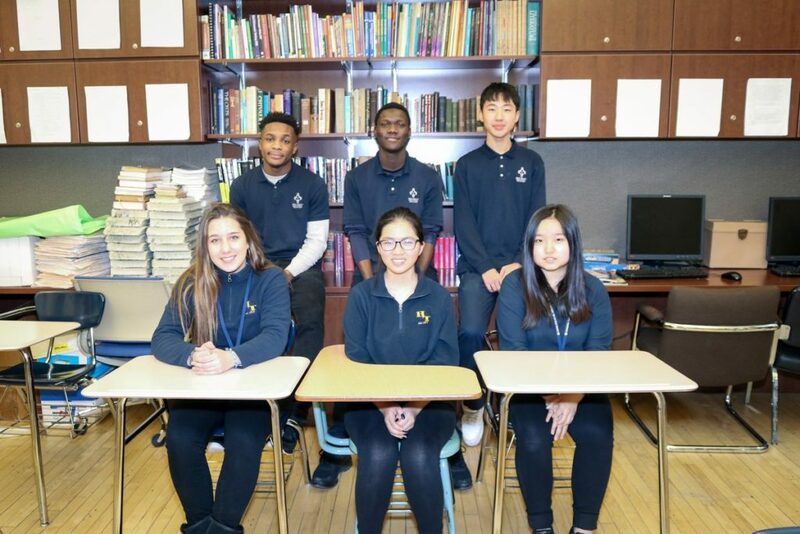 Like Hafeez and Carmen, Anthony said that classes consisted mostly of listening to the teacher lecture and taking notes, and final exams determined 70% of the term grade. Just like in Hafeez’s Nigerian school, the Wilson-Sowah brothers could be hit with a cane if they did something wrong. Weekends were “free,” except they had to clean their dorm and had mandatory church services for two hours Sunday night. But they did have movies or dances every Saturday night. Anthony said that one thing that made it harder was that these are not developed countries, so there were fewer comforts. It was hot all day (in the 80’s) and there was no air conditioning anywhere. “We had to wake up at 5:00 a.m., be ready for class at 6:00, then have five classes in the morning (each class is 50 minutes with 10 minutes rest between classes). Then, after lunch, five classes in the afternoon, then after dinner and a bath they have three or four classes in the evening,” Mike said. Each evening class is about 90 minutes. After their last evening class ends at midnight, they still have homework to do, so most students do not get to sleep until 1:00, 2:00 or sometimes even 3:00 a.m. In China, Haocheng said, achievement is everything. If a student does not achieve, the school will call the parents and tell them to take him or her home because they don’t want bad students. One good thing about the Korean education system, according to sophomore Yoojin Jang, is that it pays attention to the talents of students. In Korea, a student must play at least one musical instrument. Music class is in every student’s schedule, so the students can actually learn an instrument in school. Schools try to make more opportunities for students to have experiences that will help them express themselves and help them in their future career. After-school programs are very specific, like cooking, painting, individual instruments and orchestra. During high school years, students also go to after-school academies for tutoring. The biggest problem with Korean high school is that lectures are so hard that students cannot follow them without the help they get at the academies. For seniors, the problem is even worse. They finish school at 4:00 p.m., eat dinner at school, and then study until 9:00. Then they go to an academy to study from 10:00 to as late as 3:00 a.m. The high school years are the most important part of a student’s education before he or she goes to a university, so they don’t have much time to rest. The school does not pay for the academies, so parents must pay for their children to go to academies so they can graduate high school and go to university. Going to university is very hard; however, graduating from a university is easier than getting in. Some students, after getting into a university, stop studying because they got so much stress during their high school years. One very interesting part of Vietnamese schools is they have a mandatory nap time during school, says sophomore Linh Nguyen. They must sleep—or at least must look like they are sleeping. If they don’t sleep during that time, they can get a detention, or the teacher can call the student’s parents or guardian because the student did not follow the school’s direction. Nap time in school sounds great, but if you don’t want to sleep or you want to do something else at that time, you can get punished because you didn’t follow the rule. If a student’s grade is lower than the school expected, that student can be forced to go to an after-school program for tutoring. At the end of the semester, students take a big final exam. If the student fails just one subject, they have to take that grade again next year until they can pass all their subjects. That system makes Vietnamese students study hard so they can pass all subjects and graduate. “The Vietnamese education system is very strict, but it is also very caring about the amount of knowledge that each student has,” Linh said.